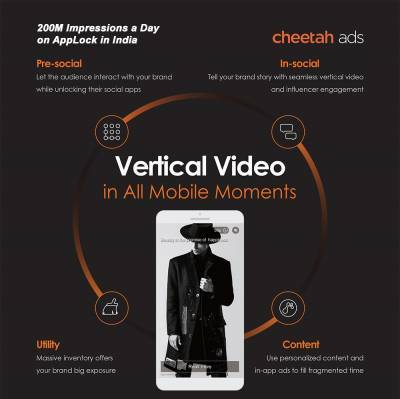 Cheetah Mobile Inc., the world’s leading mobile utility and content app developer, today announced the rebranding of its ad business in India as Cheetah Ads, with a renewed focus on bringing vertical video ads to the market. Cheetah Mobile also revealed that impressions of Cheetah Mobile’s popular AppLock feature have reached 200 million per day in India, making it one of the most successful markets for the product. AppLock safeguards users’ privacy by creating password-protected lock screens for individual apps. The feature is most frequently used to unlock social apps where people share personal data and require the utmost privacy. A recent report produced by Cheetah Lab titled “Using Utility Apps to Realize the Value of Brand Ads on Social Apps” shows that the top five countries using AppLock are the United States, India, Brazil, Mexico and Indonesia, with India ranked 2nd. A closer look shows that among the top 10 most frequently locked apps, the top two are social apps. AppLock offers brands a “pre-social moment,” the opportunity to engage with a customer before diving into a social app. AppLock supports customizable video, GIF and interactive ad formats with Cheetah Mobile’s industry-leading big data and targeting capabilities. It also allows brands to showcase 9 different product images on the lock screen. Through AppLock, brands can reach their best audiences without advertising within the social apps themselves. Cheetah Ads places beautiful, full-screen vertical video ads in a wide range of user contexts – from pre-social moments like AppLock, where brands can reach users before they unlock their favorite social apps; to in-social activity within popular influencer-powered apps like musical.ly and Live.me; to personalized content moments in News Republic; and utility moments in apps like Clean Master and Battery Doctor. Formerly known as Cheetah Ad Platform, Cheetah Mobile’s ad business has operated in India since launching there in September 2015. “We are thrilled with the success of AppLock in India. The feature’s 200 million daily impressions have contributed to making Cheetah Ads one of the top mobile advertising players in the country. With its huge mobile user base and fast-growing marketplace, India is a key country for us, and we will continue innovating to meet the evolving needs of the growing mobile users,” Chen added. Cheetah Mobile has risen to become one of the world’s top app developers with over 612 million monthly active users worldwide, most of whom are from the under-30 mobile generation. The company's mission-critical apps include Clean Master, CM Security, News Republic, and Live.me.